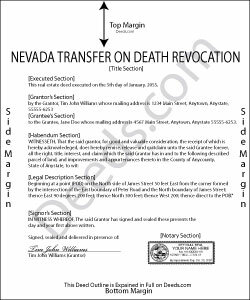 Nevada's statutory transfer on death instrument for real property is called a deed upon death. It is governed by NRS 111.655-111.699 (2013), inclusive, and incorporates the Uniform Real Property Transfer on Death Act into its text. THE EXECUTED REVOCATION MUST BE RECORDED IN THE COUNTY WHERE THE LAND IS LOCATED, DURING THE OWNER'S NATURAL LIFE. Deeds upon death offer many unique features, but one of the more unusual is their revocability. While these deeds are not affected by directions contained in a will, the statutes provide two primary ways to revoke the potential future interest. The first option deals with re-deeding the property to someone else. Because the deed only conveys the owner's current interest at the time of death, if there is no interest, there is nothing to convey. The owner might also record several transfer on death deeds for the same property. In that case, "the deed upon death that is last recorded before the death of the owner is the effective deed." See 111.677. The second option involves executing and recording a statutory revocation document, formally cancelling the recorded deed upon death. Owners may record a revocation form prior to selling the property to another or including it in a different deed upon death. This method is useful because it clearly sets forth the owner's intentions. See 111.697. It also reduces the potential for confusion caused by executing multiple deeds upon death. As with other estate planning documents, please carefully consider the benefits and drawbacks associated with revoking a recorded deed upon death. Each situation is different, so contact a local attorney with specific questions or for complex circumstances.